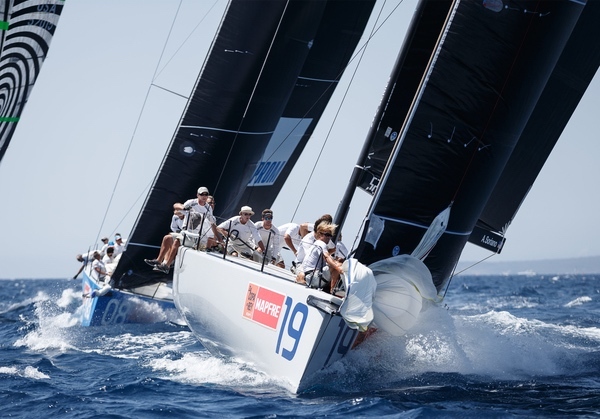 It was a golden day at the 34th Copa del Rey Mapfre for Germany’s Harm Müller-Spreer with two back to back wins on the Bay of Palma during which no boat crossed the bow of the distinictive ‘armour clad’ Vrolijk designed TP52. 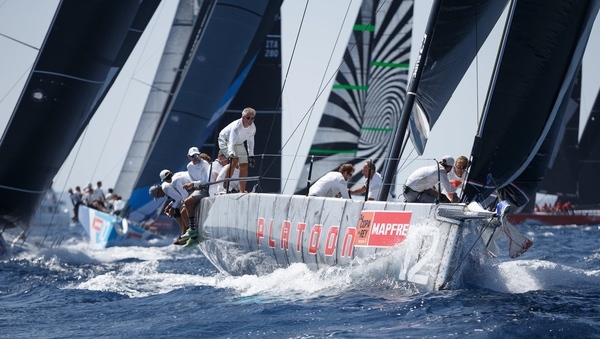 This takes them to the top of the regatta standings but only on countback against 52 Super Series circuit leaders Azzurra. While others faltered in the brisk seabreezes and sparkling sunshine, the best day’s conditions that the renowned Bay has dealt up at this showcase regatta or even at last month’s world championships, Platoon were unstoppable. 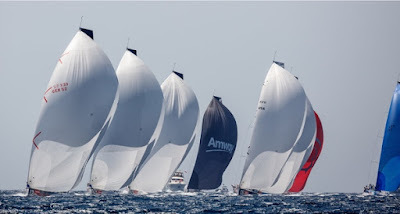 They made excellent starts off the the pin end of the line, annexed the preferred left side of the track early, showed great speed upwind and down, to lead at each and every mark. Following up from two third places, the two winning guns today hand Platoon the impetus and tie them with Azzurra who opened with two wins on Day 1 and went 3,4 today. 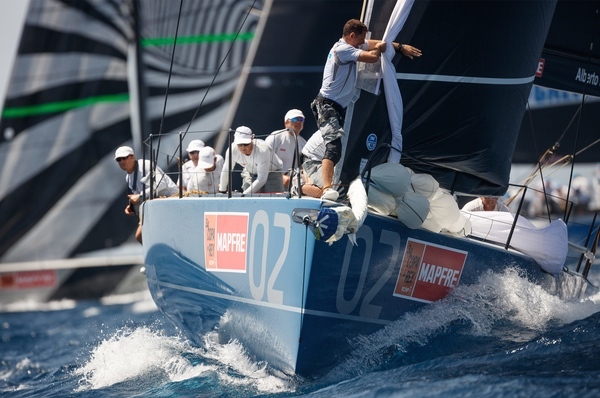 In fact Azzurra were only denied a clear one point lead by a matter of a couple of metres. That is how close the racing is. 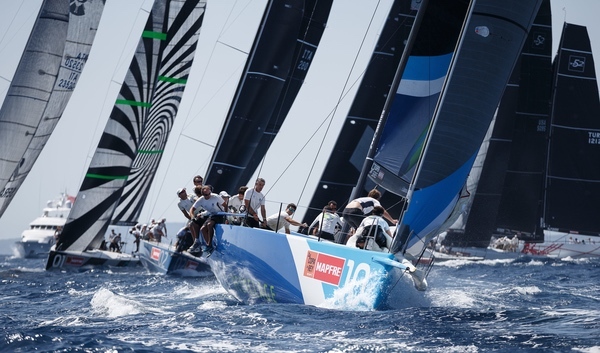 Down the final run Azzurra needed to pass Paprec for third place. At 500 metres from the finish line Azzurra had their noses in front. But the French team surged back and only just pipped Azzurra on the line. So both Platoon and Azzurra finish the day on 14 points. 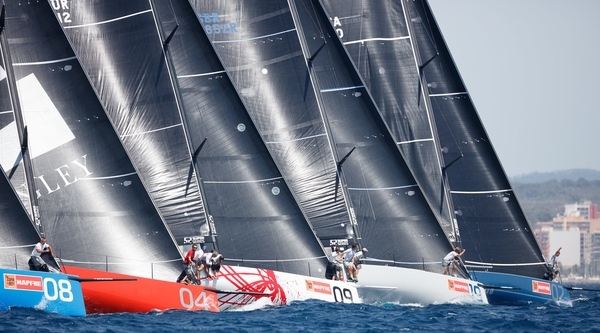 A solid 4,2 from the two heats today sees Bronenosec rise to third overall at the expense of both Quantum Racing and Alegre which took a bit of a slide. The 2014 champions had to do a penalty on the first race of the day which annulled their hard earned gains to leave them ninth across the finish line, before finishing fifth in the second race. Ths leaves them fourth overal,l two points ahead of Alegre whose 15 points today sees them fifth. Platoon had the best start in the first race, shooting momentarily around the pin end boat before accelerating strongly into the left ‘fast lane’ and making the best gains. Racing on the Charlie course, the most easterly and therefore most influenced by the wind bends of Cabo Blanco point to the left, the track was almost entirely one sided. Takashi Okura’s Sled came off the windward end of the start line and rounded second behind Platoon with Spookie and Provezza next. 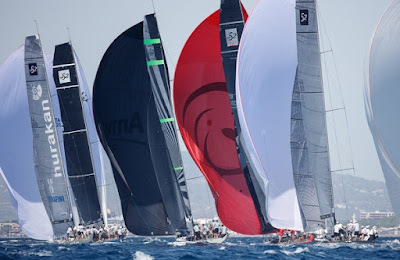 But these two faltered on their kite drops at the leeward gate, letting Azzurra through to take second behind Platoon and Sled. Quantum Racing’s start left them struggling in 10th at the top mark. They worked tirelessly to make gains but lost them when they fouled Provezza and were penalised. The second race saw Jean Luc Petithuguenin’s Paprec win the pin with a well timed start. 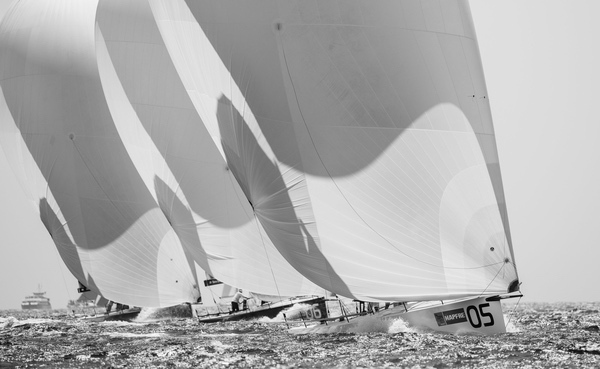 They were first to the left but could not hold the pace of Platoon and Bronenosec upwind. The French team held on tenaciously to win that third place, ensuring that ebullient owner Petithugeunin came ashore with a smile as wide as the Champs Elysee. Indeed his pleasure maybe even surpassed that of Müller-Spreer who insists they take each day and each race as it comes. 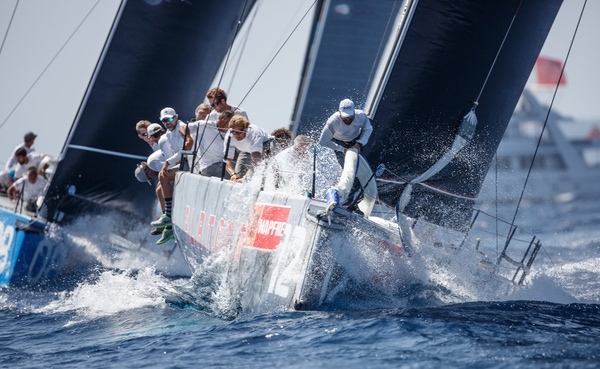 “We had a good calls to go left and we had good starts, but the main important thing is that we now have speed and the boat handling is getting better and better. I am really happy. But we don’t think about anything ahead, we just take each race day by day,” Müller-Spreer said.